YANGON — A sea of worshippers crowded into a football field early Wednesday for an open-air mass by Pope Francis, who is making the first ever papal visit to Myanmar. Ranks of Myanmar nuns in habits sang in Latin, backed by organ music as Francis began the mass. 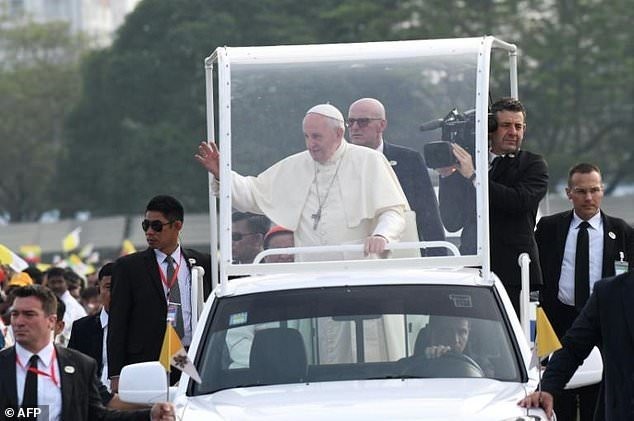 Earlier he smiled and waved as he snaked through the estimated 200,000 faithful in his "popemobile", many of the worshippers holding Myanmar flags and wearing colourful clothes from the country’s myriad ethnic groups. Myanmar’s Catholics number around 700,000, a tiny fraction of the country’s 51 million population -- most of whom are Buddhists. "I never dreamed I would see him (the pope) in my lifetime," said Meo, an 81-year-old from the Akha minority who travelled from Shan state. Like many others at the mass she is from one of Myanmar’s conflict-riddled borderlands, and travelled far to reach the commercial capital for the landmark visit. "This is the most Catholics I have ever seen," added Gregory Than Zaw, 40, an ethnic Karen who made the five-hour bus journey to Yangon with 90 people from his village. But the visit has so far been dominated by political rather than religious concerns. Francis has held private talks with both civilian leader Aung San Suu Kyi and the powerful army chief Min Aung Hlaing. He arrived on Monday in a country on the defensive after outcry from the international community over the plight of its unwanted Rohingya Muslim population, who have been driven out to Bangladesh in huge numbers. The pope avoided mentioning the crisis -- or the Rohingya -- directly at his only public speech so far in the country’s capital on Tuesday, where he took the stage with Suu Kyi. He called simply for "respect for rights and justice" while Suu Kyi stated that Myanmar’s aims were "protecting rights, fostering tolerance, ensuring security for all." A military crackdown has forced more than 620,000 Rohingya over the last three months to flee their homes in northern Rakhine state to what is now the biggest refugee camp in the world in neighbouring Bangladesh. The army has justified the campaign as a proportionate retaliation for attacks by hardline Rohingya militants in August. In the last three years, the Vatican has canonised Myanmar’s first saint and named its first cardinal before full diplomatic ties were established in May this year.